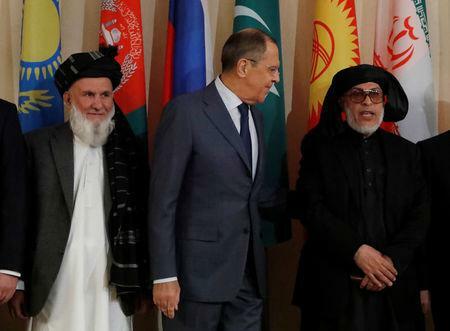 MOSCOW (Reuters) - Taliban officials attended a diplomatic conference in Russia for the first time on Friday, but reaffirmed their stance that they would only hold direct talks on Afghanistan's future with the United States, not with the Kabul government. The one-day conference underscored Moscow's eagerness to play a role in the Afghan peace process but the Kabul government did not send a delegation. Instead, members of Afghanistan's High Peace Council, a body which oversees peace efforts but does not represent the government, attended the event, where they repeated President Ashraf Ghani's offer of peace talks without pre-conditions. The Taliban have refused to talk directly with Ghani's government, which they consider an illegitimate foreign-imposed regime but said: "We are ready for face-to-face negotiations with the Americans and to discuss relevant issues with them". "The Islamic Emirate has left the doors of understanding and negotiations open," they said in a statement that listed a series of demands including the end of international sanctions and the release of detainees. Western officials and Ghani's government view the Moscow meeting with some suspicion as an attempt by Russia to push its way into a process they say must be led by Kabul. "The government hopes that this meeting leads to direct talks between the government of Afghanistan and the Taliban and that the Taliban are not allowed to instrumentalize this meeting," the Afghan foreign ministry said in a statement. The Moscow meeting took place as U.S. special envoy Zalmay Khalilzad prepared for a fresh round of talks with Taliban officials in Qatar. The Taliban delegation reiterated a demand for the withdrawal of U.S. forces from Afghanistan, where they support the Kabul government, and called for a reform of the constitution "based on principles of Islamic religion, national interests, historical achievements and social justice". RIA quoted Muhammad Sohail Shaheen, spokesman for the Taliban's political office, as saying that before starting talks with the Kabul government, "the issue of the presence of external forces" needed to be addressed. Shaheen also denied accusations by the U.S. military that Russia has supplied weapons to the Taliban, echoing a similar denial by Moscow. The Russian Foreign Ministry said that "we reaffirm our position on the lack of alternative to a political settlement in Afghanistan and the need for active coordinated efforts by Afghanistan's neighboring countries and regional partners". Washington has said its main priority is to ensure that Afghanistan is not used as a haven for militant attacks on the United States or its allies but has also said it does not expect its troops to remain in Afghanistan for ever. The Taliban statement said the movement sought "positive and constructive relations with other countries" and welcomed international assistance in aiding reconstruction. It also said it would not allow Afghanistan to be used as a base for interference in foreign countries.